Charlie's Christmas Gift was another publicly available hunt written and illustrated by club founder, Dan James. In 1995, with the club on the brink of being closed thorugh lack of funds, club Co-ordinator Sandra Young and her husband John, funded and sponsored a new hunt which would also promote their business - Chaplin's Cafe Bar & Restaurant in Herne Bay, Kent. The central character, John is trying to find for a Christmas present for his mum, aided by Charlie Chaplin's ghost. Somewhere along the way, buried in the Kent countryside, lay a silver and gold statuette of Charlie - a unique hand crafted treasure made by the late Fred Hancock (of The Last Fairy fame). The lines of the story quite forbidding. Of this we think there is no doubt. But nought from these will be recovered. The ending riddle must still be used. Late 2000: By now Sandra had received many incorrect solutions via mail to the official address published in the hunt. However Dan James apparently received an email, out of the blue, containing the four Latin words indicating success. The email was from non-member Frances Morgan who had contacted Dan directly rather than submitting a solution through Sandra. Furthermore, bad weather prevented Frances from accessing the small island in Broomfield Pond, near Herne Bay (OSGB TR 199 667) on which a casket with further instructions lay buried. So Dan issued further clues (different to those in the casket) that finally led Frances to the statuette on 30 December 2000. Frances told Dan she obtained the hunt from a friend in Kent and had spent four years searching for Charlie, but was unwilling to provide any publicity photographs of her unearthing the prize. Frances subsequently decided to re-bury the prize and set another hunt, with some assistance from Dan, on her website. 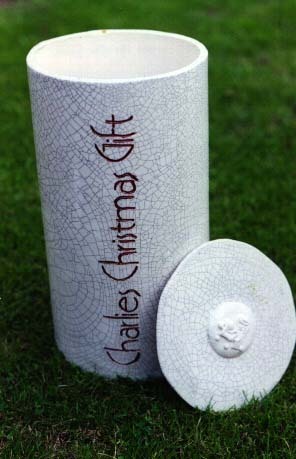 Frances wanted Charlie's Second Christmas Gift to continue in perpetuity - being reburied after each find. This second incarnation was won by club member Rachael Baverstock and former club members Stephen Parkes and Mark Parry, but as yet no third hunt has been announced. Sadly Frances' website (http://www.charlieschristmasgift.fsnet.co.uk/) is no longer available, but her hunt was published in full along with the official solution to the original hut, in the club newsletter issue 54/February 2001.